Prime Minister Narendra Modi on Monday said India has made its policies transparent and predictable and clearly defined the procedures for businesses. "We have made our policies transparent and predictable. We have made our procedures clearly defined and smooth," Modi said during a breakfast meeting with Australian business leaders this morning before leaving for Sydney. Modi said that his government is focused on eliminating unnecessary laws and regulations, making processes easier and shorter, ensuring that other government is more transparent. He also said good governance is the starting point of change and it is important to business as it is to ordinary citizens. You will begin to find a difference in India, he added. "You will not only be able to convert opportunities into partnerships, you will do it in an environment that is welcoming and easy to do business in," he said. Modi also said that his government has launched 'Make in India' as a new mission to promote manufacturing in India. He also told them about his plans to build 100 Smart cities, 50 metro projects and about the modern waste management system for another 500 cities in India. He mentioned about the projects like affordable healthcare within everyone's reach, sanitation for all by 2019, a roof over every head by 2022 and electricity in every household. 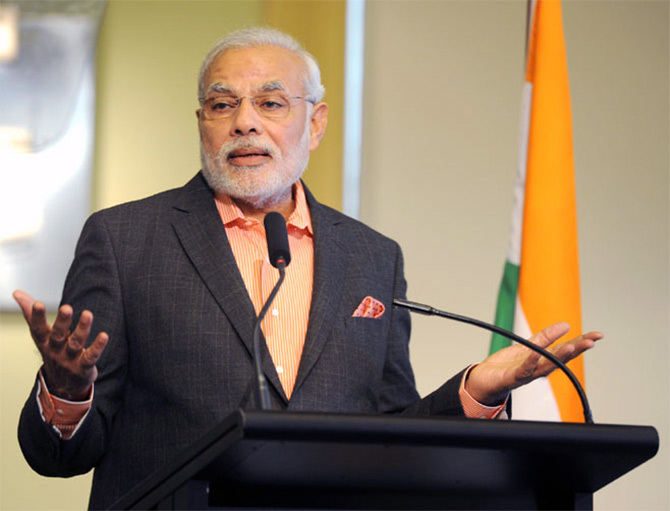 Modi also praised Queensland for sending a number of trade missions to India. "Just this September, there was a Queensland-Gujarat Energy Roundtable in Gandhinagar, the capital of Gujarat. And, I am naturally pleased that Queensland will be participating in Vibrant Gujarat in January 2015 to showcase your infrastructure capabilities", he said. "I know that you are not partial to Gujarat, but you are sending delegations to Kolkata, Delhi and elsewhere," he said. "Clean Energy with special focus on solar energy for energy efficiency, he added. He also lauded the Australian province for allowing a 16 billion dollar investment in coal mining in the state. Modi also stressed the need of a integrated partnership joint research to improve yield and farm productivity to development of agriculture supply chain infrastructure and food processing. The Prime Minister also emphasised the need to develop strong synergies in the area of information and communication technology and its every growing application in all areas of life and business between Queensland and India. He praised Queensland on its success in the tourism sector. "Indian investors would be willing to partner with you, as more and more Indians are drawn to the incredible beauty and hospitality of your state", he said. He invited Queensland to participate in India's ambitious plans for smart, sustainable, habitable cities to cater to its growing urban population. While concluding his speech he said that India-Australia relationship is comprehensive, involving economic cooperation, a growing security and strategic partnership and increasing cooperation in international forums, which are vital for peace, stability and prosperity in our region.